"Personalized Bangle Bracelet for Mother of One, Silver and Gold, Beloved Bangle"
The Beloved Bangle Bracelet is our best selling bracelet. It is so simple, yet meaningful. Start with one and keep adding each time there is another child or special date in your life. The above price is for the bronze/bronze combination, if you choose sterling the price will change. This personalized mother's bangle is a simple way to show your love for your child and keep them close to you always. We love the versatility of the metals ~ as you have more children you can mix and match to create the perfect stack of bracelets. We offer four different metal combinations so you decide if you want to mix it up or match them all. Anything you decide will look great and be meaningful to you! 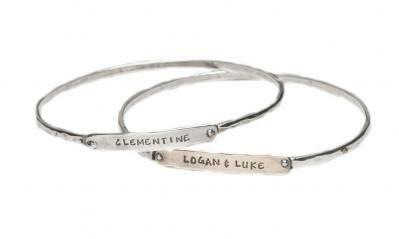 Stamp a child or grandchild's name, birth-date, an anniversary date or an inspirational word on each bangle. The price listed is for one bronze/bronze bracelet. If you change the metal combination the price will increase. Small - Approx. 7.75" around. Large - Approx. 8.25" around. The cuff piece is approx 3mm wide and the stamped nameplate is approx. 1.25" x 1.25" and can be stamped with up to 11 characters/spaces. We only use sterling silver, 14K gold, gold vermeil, and gold bronze in our products.